Small is beautiful, says the old adage. In the world of nanotechnology, small can also be powerful, game-changing, and capable of creating new types of materials with properties that have never been possible before. Working at atomic and molecular levels, and using multidisciplinary chemical, physical, biological, and engineering techniques, nanotechnology developers have proven they can successfully manipulate matter to produce specially-coated smart nano-materials that promise a vast array of possibilities for companies to create brand new classes of products across multiple industries – from healthcare to clothing, from construction to lighting, from satellites to automotive. The complexity of the production and coating process however, is expensive and difficult to scale, a problem that has held back nano-technology development in its pursuit of mass-market deployment. 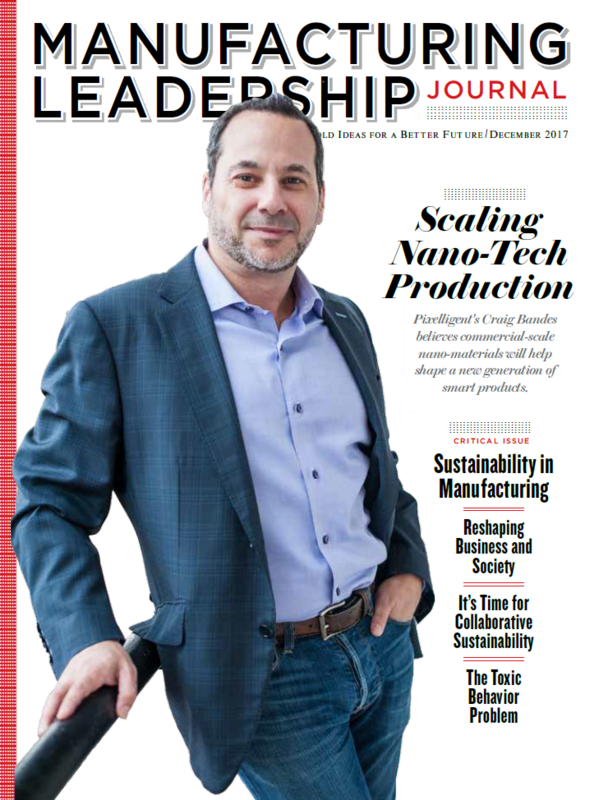 2017 Manufacturing Leadership Award winner, Pixelligent Technologies, believes it may have an answer – an innovative manufacturing process that promises to deliver coated nanotechnology materials at a commercial scale. In our latest Dialogue with a manufacturing industry thought leader, Craig Bandes, President and CEO of Pixelligent Technologies, talks with Executive Editor Paul Tate about the potential of nano-materials to usher in a new paradigm for industrial and consumer products, the company’s approach to developing and scaling its own nano-particle manufacturing process, the PixClearProcess™, and the importance of transformational innovation to the future of manufacturing. Q: How did you get involved with Pixelligent? A: I became involved with the company during the turnaround in 2009, initially working as the chief restructuring officer and then joined as President and CEO once we emerged from Chapter 11. After locking things down post the reorganization and bringing in some additional capital, my next focus was understanding why such an incredibly innovative and potentially valuable technology had, for the most part, failed to come to market as a viable commercial product. I took a deep dive across the nanotech landscape to try and understand what so many promising nanotech companies had failed. The critical insight for me was realizing that it really all came down to manufacturing, and getting the manufacturing team involved early in the material development process. This is the only way you bring breakthrough science to market in a robust way and make it accessible to a broad set of customers in some of the biggest, most technically stringent markets in the world. Q: What excites you about your role today? Q: Can you explain a little more about nano-technology and how it works? A: It’s a form of material science that works at dimensions of under 100 nanometers. The nano-particles we make start at five nanometers and are based on the metal oxide material Zirconia. Then we put a capping material, or coating material, around that surface. That creates a 10 nanometer nano composite, which then gets dispersed into a number of different solvents and polymer systems of our customers’ choosing, to create the properties and the values they’re looking for. When you start to engineer materials below 100 nanometers, their properties change and they are dramatically magnified. So as you shrink particles and materials smaller and smaller, you have ways to magnify and manipulate various properties in ways that have never been done before. As you shrink a particle, the surface area becomes bigger as the part of the cell becomes smaller. For example, if you took a particle and you cut it into micro-sized slices, the surface area would be about the size of a small coffee table. If you took that same particle and cut it in nanometer slices, the surface area becomes that of a football field. Since all of the reactions occur on that surface, the more surface area you have to work with, the more you can really affect the properties of a vast array of materials and create brand new applications based on those new properties. Q: What approach has Pixelligent taken in its nano-material manufacturing process? A: It’s a complex chemistry-based physical process that requires extreme pressure and heat. It’s also a three stage process – we synthesize and form the Zirconia nano particles; then we have the capping process where we put a material on the surface of the nano particle; finally we disperse it into a broad set solvents, monomers, or polymers, depending on what the customer needs. All of that combined is what we call our proprietary PixClearProcess™. We’ve had to scale up all three of those processes simultaneously, all of which were new processes for the market, and show that we could do them consistently, and measure the quality of those systems over time. It was a very robust effort. We believe this approach represents a paradigm shift in how high performance materials can be developed and manufactured. Q: So how did you scale up that manufacturing process to make it commercially viable? Today, we have a new 40-ton manufacturing line that will be brought online between Q1-Q2 of next year. The equipment is already pretty much integrated and installed in our outsource manufacturing partner and really, we’re now just waiting to match it with the market demand so we can finish the last bit of commissioning. Some of the biggest companies of the world have already come through to kick our tires and see what we have. That has helped to prove to our customers that we’ve broken through the scale up barrier. Now it’s a matter of optimizing the process to achieve the right balance of performance and cost structure for what our customers need. A: The challenges are significant. One of the initial obstacles was a credibility issue about bringing our nanocomposites to market. The nanotechnology promise has been around for over 20 years. Nearly $24 billion has been invested around nano initiatives from the US government National Nanotechnology Initiative alone, and billions more have come from venture capital and corporate investors. A lot of big companies have been down this path, spent meaningful resources and time and money to try to bring some of this innovative nanotechnology to market, only to find that in the end, it was either not really scalable, or the economics would never work. So we had to differentiate ourselves and clearly show we had a balanced approach, not just a materials technology focus, but also in manufacturing focus, so we could break through the noise and achieve a higher level of credibility. It took a number of years to do that, but I think we’ve gotten through most of those challenges at this point. Now it’s more a matter of trying to accelerate the adoption curve with our global customer base. We’re based in Baltimore, but most of our activity – 80 percent of it – comes out of Asia. Managing the gaps in culture, and language, and timeframe, in order to get the product into market in a timely fashion so we start to see more revenue traction, is the current challenge. We’re moving from the early incubation phase around the technology and the manufacturing platform. We’re now getting into mass production, starting this year. So we need, to the best of our availability, to continue to accelerate the adoption curve of some of the biggest companies in the world to get our products into the market as quickly and efficiently as we can. Q: What do you see as the potential impact of nano technology for the future? A: It’s been called the next great industrial revolution, and you’re already starting to see it have significant impact across multiple industries. For example, in biotech and nano medicine, you can create small atoms that can get into a tumor and attack it from the inside out. In construction, you can have stronger and lighter structures by including a number of different types of smart materials. It’s also going into next generation windows in office buildings, where you can change the shade of the glass by simply touching it, so you can create tremendous benefits in cooling effects inside the building, which has a big environmental impact. And there are already hundreds of parts of some automobiles that have been improved through nano-enabled science and technology. For products like displays and solid-state lighting, which is our focus at Pixelligent, we use our innovative nanotechnology techniques to dramatically increase lighting efficiency by over 100% and achieve near perfect transmission. So, when you combine this with new manufacturing processes like 3D and Ink Jet printing, it gives our customers, partners and device makers a lot more knobs to turn to help improve the performance of their current products, or to create brand new classes of products for the future. I would say in every major commercial, industrial, or electronic application you can think about, you’re starting to see the impact of nanotechnology coming into those products. It’s spreading everywhere. Q: How important has collaboration with partners and customers been to the development of this new technology? A: We wouldn’t be around without collaboration. I don’t know anybody in this day in age who does anything behind closed doors anymore and hopes to be successful. From the beginning our whole approach was to collaborate to help us get from what was initially a science project, to become a valuable product. So we went out very early to customers, well before we knew what the final product would look like, and said, “Here’s what we’re doing, here are our capabilities. Tell us what you think.” That’s when we discovered we had invented the best dispersion technology in the world. You’ve got to collaborate with customers and with partners. We do it every day. Customers send us their proprietary materials so that we can mix our dispersion into that system, and do some of the testing for them, and then send it back to them to replicate it to try to accelerate the effort. We’ve also received a lot of great support from the U.S. government, from the National Institute of Standards and Technology (NIST) and significant grants from the Department of Energy around our OLED lighting materials, and we work closely with key industrial partners, some of the biggest advanced display companies in the world. Today, you just can’t keep everything inside and then hope you’re right at the end. Q: What’s do you see as the potential for new Manufacturing 4.0 technologies in your nano-scale manufacturing strategy? A: We actually learnt a lot about this at your Manufacturing Leadership Summit this year. For us, it’s important to understand what’s happening in the reactions that we’re doing. So we spend a lot of time on lab information systems and working with the tremendous amount of data that comes out of there. That data then gets used in very sophisticated simulation exercises and/or designs of experiment exercises. Right now, we’re probably just starting to scratch the surface of learning how M4.0 tools can impact our development processes. We’re starting to have a deeper understanding of how the data can affect our ability to improve product performance and production yield in our manufacturing lines, which ultimately will impact our overall business and provide additional value in the future for our customers. But part of what we learned at the Summit is that you have to have a balanced approach about understanding which of these M4.0 tools can really have an impact for you and, quite honestly, which could be a distraction. I think there’s a steep learning curve for a company like us at our stage of evolution, and even the largest companies, about where to focus your energies and resources. It’s important to distinguish between the more practical tools, versus the pieces that maybe sound cool but we don’t really see how they’re going to impact us, now or in the near future. But there’s no question: a better understanding of the data and the intelligence behind that data will help us have a significant impact on how we accelerate where we go from here. Q: What do you see as the biggest challenges facing the manufacturing industry in the next five years? A: It comes back to people. Both attracting and retaining the next generation of talented engineers and scientists that are coming out of colleges and universities from around the world, and retaining your key team members with years of industry experience, by making sure that you create what I would call (and others call) a culture of innovation. You give them room to run, you give them room to fail and learn from that to move the organization forward. I think if you do that, then all the technology that’s coming out around 4.0 starts to become very useful and valuable. Because if you don’t have the right people onboard that are fully bought into the value that all these new tools can bring, and are willing to make the investment in learning how to properly use those tools for your business, it’s not going to work. You can invest millions of dollars in great tools but if you don’t have your people behind it, it just doesn’t matter. A: I think it will require leaders to understand that his or her job is to consistently challenge yourself and your team, even when things are going well, and to make sure that you’re not losing focus on the sort of culture of innovation that got you to where you are now. There’s also a new type of mindset with the younger generation of employees, the so called Millennials. As leaders we need to work out the best way to marry their energy, intelligence, and enthusiasm, with the mission and goals of the organization. This will mean challenging some old rules of management by sharing/assigning more responsibilities sooner than you have in the past in order to keep them motivated and challenged. Clearly there needs to be a clearly defined and timely accountability loop so this doesn’t lead to chaos, but it requires managers to provide them with more running room around clearly defined goals. Leaders also need to think about the best way to leverage all this great new technology that’s coming out in 4.0. How do we make sense of the massive amounts of data coming out of our businesses every day? And then, how do you distill all that back down to the human factor, to make sure that you’re bringing in the people that can help make all of those pieces come together in a valuable way? So as a leader, I think you’ve got to think about what sort of teams you need to have? What are the right tools you need to have? And not lose sight of your ultimate mission to deliver the value you want to bring to your customers and into your market. And then make sure everyone is focused on that, every day. A: It’s “Transformational Innovation”. How do you really use innovation, in the broadest sense, with the Manufacturing 4.0 piece that we’ve been talking about, developments in new material science, and new technology that’s coming out from universities and research labs every day? How do you use all that innovation to really transform a company, an industry, a market, or a product, across the segment that you care about? That’s the future of manufacturing. Read the original Q&A piece here.